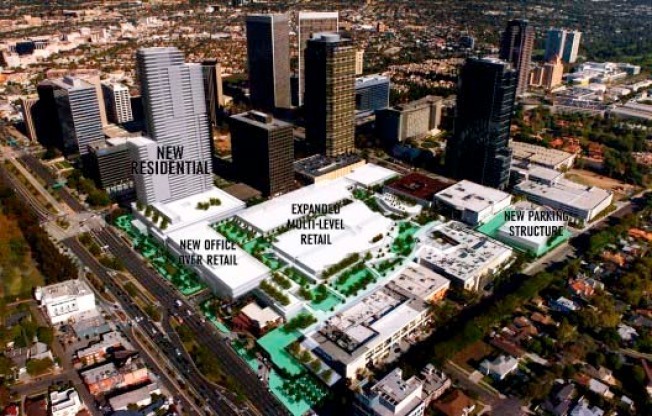 Despite neighborhood group concerns that "the project is too big and too tall, and would produce too much traffic," the LAT reports that the LA Planning Commission "unanimously...approved Westfield Group's plan to expand its Century City shopping center after the developer agreement to make modifications." The $800-million project includes relocating Bloomingdale's, adding retail, parking and office space, and "replacing an original Welton Becket-designed tower with a 39-story, mixed-use building with 262 condos." Modifications include adjusting original plans for a 49-story tower to the agreed upon 39 levels. And per Curbed, responding to traffic concerns: "the development will include a transit demand management (TDM) program that will provide alternatives to single occupant vehicle trips. It will also set aside an easement for a future Purple Line station. Westfield has also agreed to hold a community workshop on design issues related to the streetscape and the residential tower." This is to further Westfield's goal of a "live, work, shop and play" vibe.